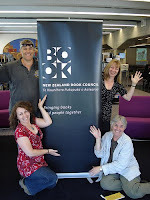 Words on Wheels (WOW) is a program by New Zealand Book Council that brings a group of top authors by bus to remote libraries, schools, and community centers. Each year, the bus goes out for a week tour to a different rural area of New Zealand. No photos on the website, but Flickr has a nice collection in the collection of Christ Church City Libraries. Here are the five 2009 authors: Vanda Symon, Janet Charman, David Geary, and Anna Mackenzie. Missing from photo is Steve Braunius. It is extremely valuable for the students to see that writers ARE real people and it is appreciated by the writers to know what readers like. I was great!